The BenRiach Distillery Company has announced a number of new Scotch whisky releases. 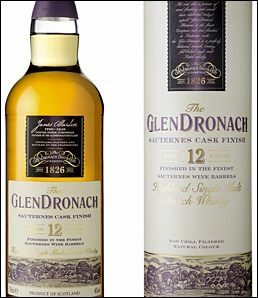 From the GlenDronach Distillery is a 12-year-old Sauternes Cask Finish single malt Scotch whisky. It replaces the 14 year-old Sauternes wood finish expression, launched four years ago, which has now been discontinued. Bottled at 46%abv, without colouring or chill filtering, the 12 year-old Highland malt was initially matured in European oak and then finished in a small batch of Sauternes wine casks. Sauternes is a sweet dessert wine made in the French region of Bordeaux. According to master distiller Billy Walker, the aim of finishing the GlenDronach in the wine casks is to create an extraordinarily refreshing single malt – delicate and sweet with a balanced acidity and fruity complexity. Also new from GlenDronach is Batch 6 of GlenDronach’s Grandeur series. This latest stellar batch from the Aberdeenshire distillery is a 24-year-old whisky selected by Billy Walker from some of the oldest and most characterful Oloroso sherry casks at GlenDronach. Bottled at 48.9%abv and individually numbered by hand, the batch is limited to just 1,180 bottles filled with “luscious fruity aromas, rich sherry and dark chocolate flavours”. From the BenRiach Distillery is a limited one-off 10th Anniversary bottling. Back in 2004, Billy Walker and his two South African partners Geoff Bell and Wayne Kieswetter purchased BenRiach. On September 20 that year, the first distillation under the new owners was filled to cask. Ten years on, Billy Walker has married together four outstanding casks from the first week of production to create this limited bottling, at 46% abv, with only 1,106 bottles available for sale. Also newly released is another exclusive expression – the BenRiach 35 years old. Non-chill filtered, bottled at natural colour and at 42.5% abv, it complements BenRiach’s award-winning 25-year-old, which was released in 2006. Like the 25-year-old, the 35 years old is a classic Speyside, proffering some “lovely fruit notes and dry spice – sweet, fruity and simply beautiful”. The company has also announced that its Glenglassaugh Distillery is launching a 51-year-old single malt. Bottled at cask strength on May 14 this year, non-chill filtered and with no colour added, this is a rare dram selected by Billy Walker from 1963 cask 3301, which has been maturing in the company’s coastal warehouses at Portsoy for over 51 years. Distilled and filled to cask on February 15 1963, it is one of the oldest casks in the distillery’s inventory and brilliantly captures Glenglassaugh’s unique Highland coastal character. Founded in 1875 by local entrepreneur James Moir, Glenglassaugh was mothballed for over 20 years, lying silent and forgotten until production was re-started in 2008. It was taken over by BenRiach last year and the distinctive fruity character of its whisky is loved by all who discover it. 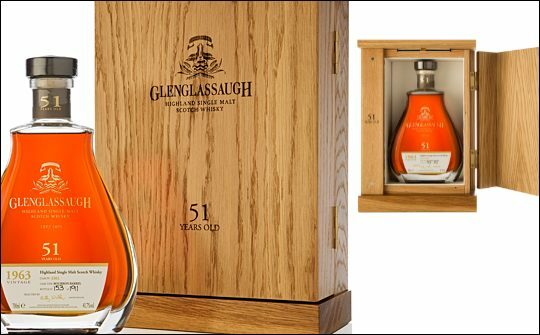 The Glenglassaugh 51 Years Old is presented in a wooden box, hand-crafted in Scotland. Each bottle is hand-numbered and comes with a certificate of authenticity signed by Billy Walker.